relative basis, than their conventional counterparts. electric vehicle models was less than for gas, hybrid, and hybrid plug-in models. internal combustion engine,” the agency wrote. internal combustion engine," the agency wrote. 1950 and after 1990 ~6mm/yr]. EVs still lose because they have such hideously low residual values. Used conventional autos OTOH are worth double that of used EVs. More than makes up for any saving in operating costs. Some EV models are selling for just 25% of retail after 24 mo. one because of the depreciation whack. rebate in NY, which lowers EV fleet TCO on the backs of taxpayers. Even with punitive carbon taxes, conventional autos are still a better deal. Nissan Leaf's went from 750/mo to 5/mo. buck", that tells you everything you need to know about true EV economics. per unit compared with a comparable Toyota ICE. [Late night news says "several" homes have been destroyed]. 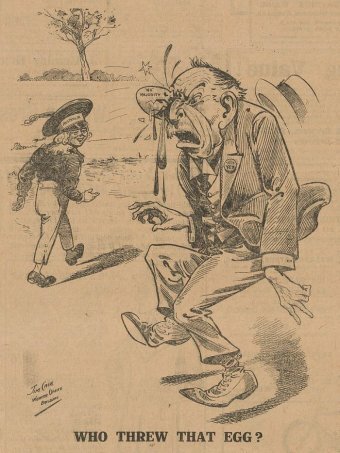 most infamous egging in 1917.
up support for compulsory conscription. It was not a popular policy. off his hat in the process. As legend has it, Mr Hughes ordered a nearby policeman to "arrest this man"
but the Queensland policeman famously responded "you have no jurisdiction". Ausgrid says it still doesn't know what caused the outage. Analysts are divided about China's treatment of Austroyan thermal coal. Some of Tesla's value may be that it's _already_ a collector's item. It won't console a tar gooper much but this effect will increase as larger auto companies come out with cheaper cars. "expected" to? In other words weeze ain't git the "actual" part yet. of their value at three years of life. chumpsky doesn't want anyone to look at EV's that became available recently. buy today. Things do change as time passes. Q: What has substantially changed in two years? 35-55 percent of their value at three years of life. federal tax credit and the state rebates? Cheaper batteries & more charging stations. ago about cars that were purchased 5 years ago is worthless. The growth rate of the steel industry in the U. S. was over 25% a year for 3 decades, 3 orders of magnitude between 1860 - 1890. We're going to do it again with green energy. What part of "doesn't include cars you can buy today" did chumpsky not understand? value at three years of life. tax credit and the state rebates? chumpsky is whining about the actual selling price of the cars. Chevy Volt and Nissan Leaf have been around since 2010, did a dog eat the data? costs (maintenance, fuel, and ancillaries). There seems to be incident after incident where it's really obvious some large entity didn't do a spreadsheet, i.e., UPS taking a week to figger out the payback time for an electric truck would by 60% less than originally calculated or the Tesla battery actually saving Australian consumers millions more than in the sales pitch. Not doing a spreadsheet is like not counting the money in your pocket. It's too late in the day unconscionable for a Podunk town not to be doing them let alone a large city or corporation or utility. Again, not doing a spreadsheet is like not counting the money in your pocket. fleet ownership, the piss-poor residual value still makes them a bad deal. You certainly need to CAT (consider all things) but that shouldn't be too difficult in these battery cases. Apparently Musk didn't even bother looking at the peak pricing of the utility. they last forever so you never buy new ones? cheaper... based on circumstances that may not be realistic. front of you, well, it takes all day now doesn't it? you charge overnight, or whenever you feel like it. want amenities, like a charger, they cost you a lot more. I'm 4.5 hours from NYC and the situation is attrocious! does anyone want to lay odds on them being free? combined, pretending we should care about CO2. It's a much easier, more economical solution yet it's not even discussed.